Fun, flexible interactive games support each lesson and build Math fact fluency! If you have an interactive whiteboard in your classroom (or a computer center), you can enhance your Factivation!® lessons with practice and fluency-building games like the ones below. Each game is designed specifically to cover the facts from the current lesson while providing reinforcement of facts from previous lessons. 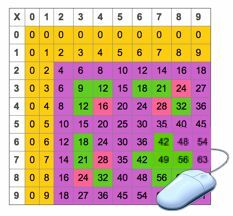 You can also utilize the games in the “Smartboard” section of each lesson on a stand-alone computer as a Math Center, allowing 2-3 students at a time to work on fluency-building. Teachers receive a 90% discount off of student Fact Lab memberships. The Fact Lab is an exciting area of the Factivation!® website designed especially for kids. Fact Lab memberships allow students to login from a school computer lab or home to access videos, games, timed challenges, and printed activities for each lesson! Parents appreciate the at-home practice that the Fact Lab provides. The samples below show some of the licensed games within the Factivation!® program. This sample is from Multiplication/Division: Lesson 6. Description: This fluency building challenge will keep students on their toes with a strict time limit per question. Call volunteers to the Smartboard for a quick review. Description: Students will want to play this multi-player or multi-team game again and again. Choosing the correct product earns five shots in the carnival booth. Silly sound effects! Description: Entertaining, challenging, and self-motivating: this fluency-building game is a favorite among students and works great on your interactive whiteboard!